No celebrities other than Ray Charles or Andrea Bocelli will be fooled into believing its a Rolls. The front grill is probably attached with wood screws and obscures most of light from the stock Lincoln low beams. The guy on the far left with the handgun necklace is Limo Bob, but we aren't sure who the two Poison/TravisTritt impersonators are supposed to be...or the lady. 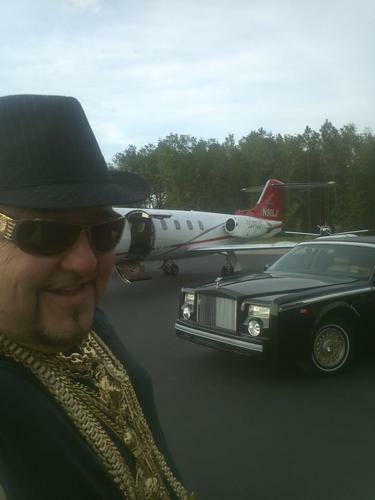 Apparently there is a private airport without a locked gate that you can drive your "Limo" onto and take a picture next to some poor rich dude's LearJet. Someone must contact the FAA. 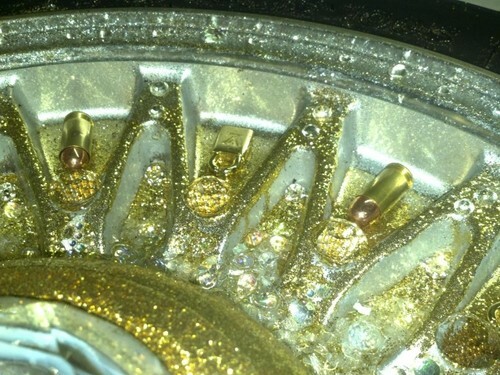 A close up of one of the rims reveals bullets, locks and glitter applied haphazardly to the surface... avoid pot holes unless you are wearing an armored vest. See another horrible riddler gone bad...don't email us...please! ~ okay, the guilt is overwhelming. i apologize and promise to behave more gooder in the future. but could i trouble you for information about the 'pants-optional' airport (or model). Not only is the last picture not the same car, its also a very different blonde. Ray Lewis Super Bowl prize? It seems that the vast majority of photos in the listing are not the same car. What a douchebag...whored up on the outside and the interior looks less cushy than my wife's minivan. The whole reality show thing is just getting tweaked way out of whack...I see absolutely nothing "real" here with the car or the seller. Any chance that one guy is wearing lizard skin boots? What could be more à propos! Limo service can even allow you to acquire reservations at the best restaurants and VIP services at most well known clubs. We are offering for Royal Ride car for Rental service in affordable price.Now its easy to hire Royal Ride Car's in affordable price.Pick and drop service is available. Honestly saying, it is all about business and profit. These are the basic two words that really matters. Car rental companies are many in all location however they are all looking for their very own profit.The car rental company should realize that the top priority for them is the customer satisfaction. And that's what the Airport Van Rental ( www.airportvanrental.com ) has given me everytime I use their service.